Hi, my name is Alex and I spend a lot of my time online. I share a lot of my life, personal thoughts and feelings here as well as create imagery, useful content and tips. But with this growing online presence comes a new, different responsibility. Primarily, the expectance to be ‘on’ at all times, and to answer everyone’s questions on pretty much everything. 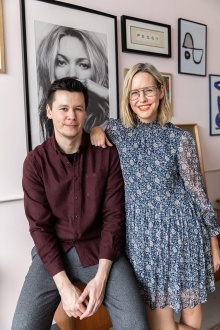 Instagram, in particular has made everyone so accessible and really broken down barriers in terms of contacting your favourite chef, asking the opinion of a great stylist – it’s all at your fingertips (literally!). 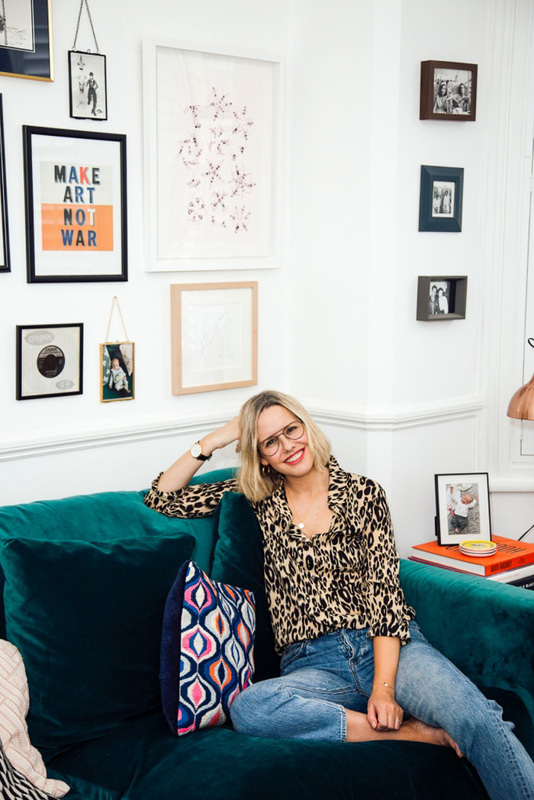 Now this isn’t a moan – I actually love this part of my job, I used to work for magazines and brands where no one interacted – no would ask a question because they never expected a response. Personal relationships (and dare I say friendships?) are what I love about Instagram – it’s ‘social’ media, after all – and I love how engaged everyone is. But with it comes a whole host of what I would call ‘less friendly banter’. With the introduction of ‘Direct Message’, people can send a private message, one that no one but the recipient will see. And as you can imagine, some aren’t that pleasant. Now, this isn’t meant to be a ‘pity’ post, I am 100% for free speech and often, a well argued point has made me rethink some things. I am very fortunate that I have very supportive readers but there are lots of accounts that receive unnecessary trolling everyday (I even reported someone on another account today). So this is for them, too. I am a big fan of turning messages off when it gets too much, I get around 200+ DMs a day on top of my daily workload (some days it has been more like 700), personal and work inbox, Instagram comments section etc) and generally love having a natter with my readers – I’ve even had some 5am laughs during my delirious baby-feeding all-nighters. But what I am saying is that this is new territory for us all so I thought it could be useful to put down some thoughts on etiquette. This is meant to be light-hearted, not a complaint – and might open just some eyes to the kind of messages we receive….! 1. If you’re not willing to post your message publicly, does the message need to be sent? I am all for constructive feedback, but often there is a reason the message is being sent behind closed doors. 2. Don’t correct people on grammar if they haven’t asked for feedback. This is something I have written about in my newsletter before – it gives people a complex, mistakes happen, most bloggers are one-person bands, they don’t have sub editors, most are self edited and published, they might not be good at spelling, perhaps dyslexic. 3. If you’re typing a question in the middle of the night, think about whether you really need to know the answer. I used to be a middle of the night emailer at work – I’d email to ‘get things off my chest’, often to junior members of staff. It was rarely important, but I had no idea how it affected other members of my team, they would open the email just before going to bed and then be thinking about it as they went to sleep. This wasn’t my intention but I try not to do it nowadays. I think it’s nice to think of this for Instagram too. 5. I know we’re all busy but perhaps word the question as a phrase, don’t just type ‘shoess???????? ?’ under a picture. 6. Maybe rethink sending a pure rant to your favourite blogger (unless they are opening a discussion about something). I am not on Instagram to hear other people’s rants unless I have chosen to follow that individual. Someone grrrr-ing at me because I shared a photo of our Queen, because they were appalled that she sat in first class on a train is not how I wish to spend my time. 7. If you can help it, try not to give away plot spoilers to a programme I have said I’ve just this evening started watching. I know it’s tempting….! 8. Just because we (bloggers) have a public, online account does not mean we ‘owe’ anyone information or content. A few people have told me recently that I have a responsibility to share certain things; I try my hardest to be mindful, polite, helpful but it is, at the end of the day, okay for me to use my channel as I so wish. I do not owe anyone anything other than what I put out there. 9. Try to remember Instagram isn’t real life. Even the seemingly realest of real accounts aren’t showing you everything – it’s still a highly edited version of what people wish to portray. If someone isn’t ‘real’ enough for you, unfollow them – some people prefer to be real, others don’t. It’s their choice. 10. Equally, some people have a moral compass, some don’t. It’s life, I tend to unfollow accounts that I don’t feel are authentic to themselves before I get too annoyed. 11. Let’s not be outraged when people disappoint you. People change, mature, their opinions develop. If it’s not how you want them to act, that’s okay but it’s their choice. People can be lots of things, most of which seem at odds with each other: nice yet annoying, seemingly perfect yet flawed, feminist and love makeup, care about the environment and clothes. We’re complex beings and that’s what makes us interesting. 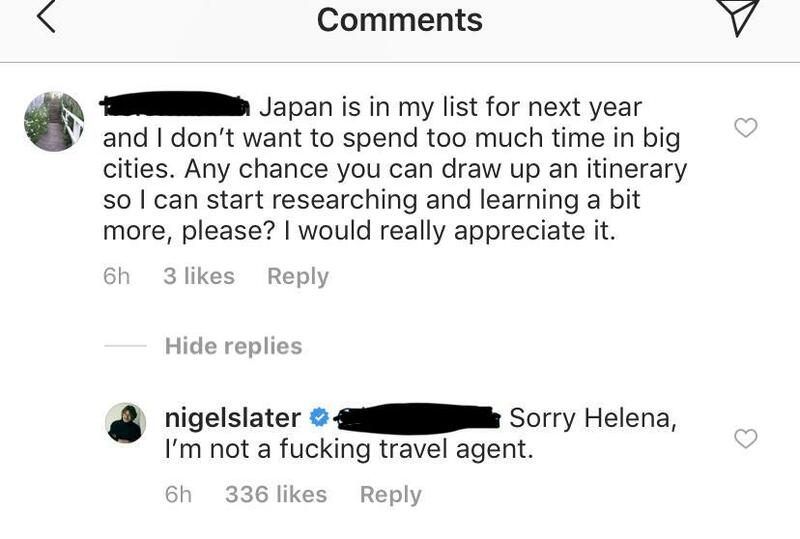 Even lovely Nigel Slater has off days with Instagram! And finally: remember there is a human at the end of the message. Not an automated assistant, it takes time to respond to people and sometimes a quick, icy message just reeled off on a bad day (sometimes even well meaning) can be the message that keeps the respondent awake at night or ruins their evening. 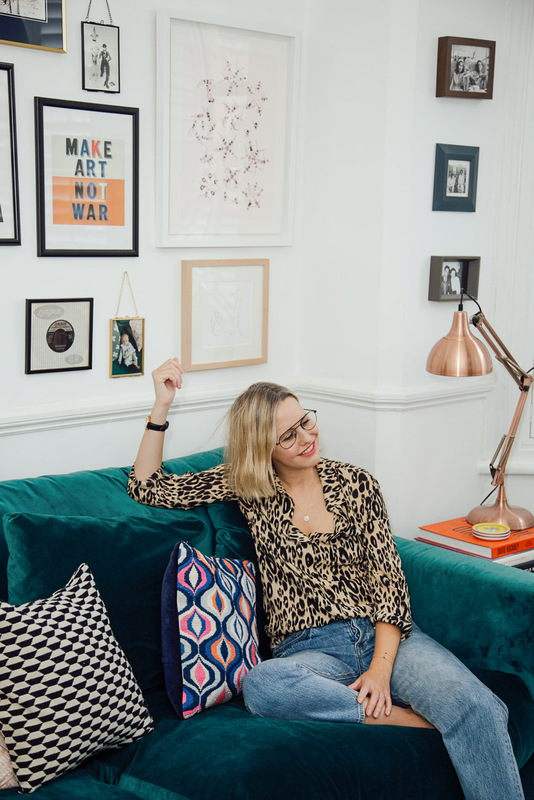 Don’t get me wrong, I love Instagram and it has brought so many lovely opportunities but sometimes it can be a great big time vacuum…which is why I love the blog so much – I can write long articles, have more focused discussion and debate and share with less anxiousness. The way we’re consuming media is changing at such a rate it’s nice to have my own, personal platform to place my thoughts. And I count myself lucky to have lovely, engaged readers who love to share their thoughts and recommendations with me, but as with most popular platforms, it seems to come at a price. The problem with “correcting” grammar, is that it disregards how class, race, privilege, and ableism informs the way language is learned. Arguing about the use of “correct” grammar is discriminatory and shows a deep lack of awareness. Instead of correcting grammar, maybe those people should learn about how language has been historically used to oppress people. I certainly wouldn’t feel proud to be a “grammar” policeman, that is for sure. Thanks Alex! Really enjoying the blog! I’ve found myself going back to reading my favourite blogs as I did before Instagram took over my brain! Thanks again! And happy birthday month!!!!!! I think our litmus test should be would we want out our children to behave this way at school. Would you want your child to taunt or diminish or others because they made mistakes on a spelling or grammar test. Would you want them to corner a classmate and tell them exactly how poorly they thought of them. Or would you tell them it’s okay not to like a person or behavior just use the walk away option when possible. Tell them to be tolerant of the tastes and choices of others even if they aren’t aligned with yours. Pandora Sykes never has messages in her stories and I think that’s understandably ok . . She never speaks about anything other than the positive of her life post baby and I’m sure she get plenty of unwarranted ‘feedback’ , but if she doesn’t put it out there , no one has anything to comment on . .
Oh politics! It can be so divisive, can’t it?! My sons have a phrase “don’t be a lurker”, implying you should always engage or comment with a post. I don’t agree. I “like” posts to acknowledge them but am mindful of clogging up comments sections with pointless phrases that a poster might feel obliged to respond to. I think some people want to feel part of the action even if they’ve not got much of interest to add. Re- reading this makes me sound a bit negative but what I’m actually trying to say is that I enjoy reading Insta and a few blogs, yours of course, but don’t feel the need to constantly join in. If you go to watch a band play you don’t have to keep shouting at them saying you like them (or not), and how the set is going, you just listen! I would definitely want to receive such feedback on longer posts myself (not on tweets and short Instagram posts, as the genre is different). Do you find such comments offending?